The eventful day arrived at Cecil and we were in dress canvas. The skipper and pilots were standing in front of a long table with the squadron silver and this and that. Ensign Epstein was regulated to the back of the pack in his proper place as a junior officer. Well, the F8U-1P arrived and it was taxied up to the greeting area, complete with red carpet. The pilot shut the bird down and exited the cockpit in full flight gear. The ground crew opened the photo flash panels just behind the canopy and removed his personal gear. In the interim the skipper and senior officers made a bit to do about greeting him. They walked through the red carpet area to the table where a welcoming speech was given. After the show and tell one of the line crew brought the pilot's flight bag to him where he opened it and got his WHITE HAT and put it on. The officers looked very stunned with this turn of events! Yes indeed. I spotted Ensign Epstein who had the biggest grin on his face. Seems the pilot was from VR-52, a 1st class mech AP. He came down to the shop area after a bit and we found out he was one of the enlisted pilots from VF2, the flying Chiefs of WW2 fame. Yep that was a good day after all and did the crews' hearts good. He was a ferry pilot from VR51 or 52, can't recall that far back. Flew it from Chance Vought to the squadron. As I recall the planes came in with both Officer and Enlisted AP flying them. The AP were 1st class and Chiefs. What I seem to remember when I talked to some of them they were the last of the APs and were originally from VF-2, The Flying Chiefs. 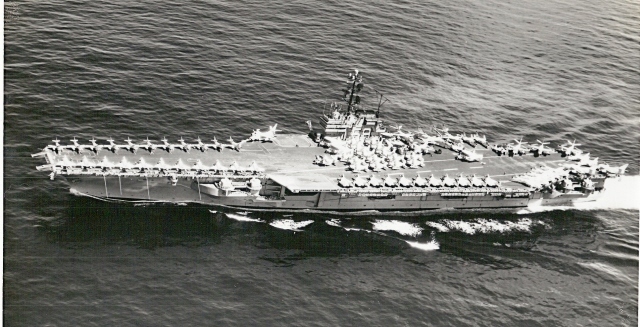 VF-2 was on the CV-2, which I think was the USS Lexington, but you had better check. Those early days were something as you could get away with a few things. Like the logs and records Chief getting the used 18 ply tires from the F9F-8P and then mounting them on his Crosley Station wagon. Yep times were good. On my three years of detatchments on the USS Shangri La and Forrestal, there were a number of fatalities, mostly aviators who crashed. Being a photomate, I was able to see the photo evidence of the collected debrie: a helmet, scraps of metal, and some body parts. But, my only witness to a death occurred on the Forrestal flight deck. The flight deck work is rated as one of the world's most dangerous jobs. Rightfully so. My experience occurred during a launch and I was just in front of the island watching a F8 taxie up to the angle deck cat. The pilot was a young Ltjg from one of the fighter squadrons. I remember him as being very handsome and friendly. Everything seemed normal but then, his plane started to move in a strange slow motion that I knew was trouble. The linkage between the F8 and the cat had broken prematurely and because he was already at full power, he could not be stopped from going over the angle deck. I remember the F8 dropping over the edge and the last thing I saw was his tail disappear from view. The ship immediately made a hard turn to port to avoid sucking him into the screws. I remember trying to stand upright as the ship made what seemed like an impossible turn. He did not make it. There are some links on this site that help us to understand the terror of this situation: There is a picture of a (more senior/experienced/lucky) Shangri La pilot escaping from a sinking F8 (while I was aboard) on "We Love Crusaders" (look for "Crusader Mishaps"). Also, if you log on to the Gunfighter's site, "Links and Acknowledgement Page", and look for "The Miottel Collection" and go to the bottom of that link for "Crash" (his call sign) Miottel's account of his escape from a sinking F8. Fun reading. ADDENDUM: The following information is provided to explain the cause of the accident. The VF-103 catapult accident on Forrestal during the '62-'63 Med deployment which killed the pilot, Walt Davis. I was the squadron safety officer at that time and was the senior member of the accident board. The cause of the accident was not a holdback problem. Recall that the F-8 used a launch pendant vice a bridle. The pendant hooked to the aircraft over a short bar/pin between two somewhat rounded flanges that were part of and below the aircraft keel. Those flanges were not completely flat on the bottom surfaces but were machined to a small fairing along the bottom. 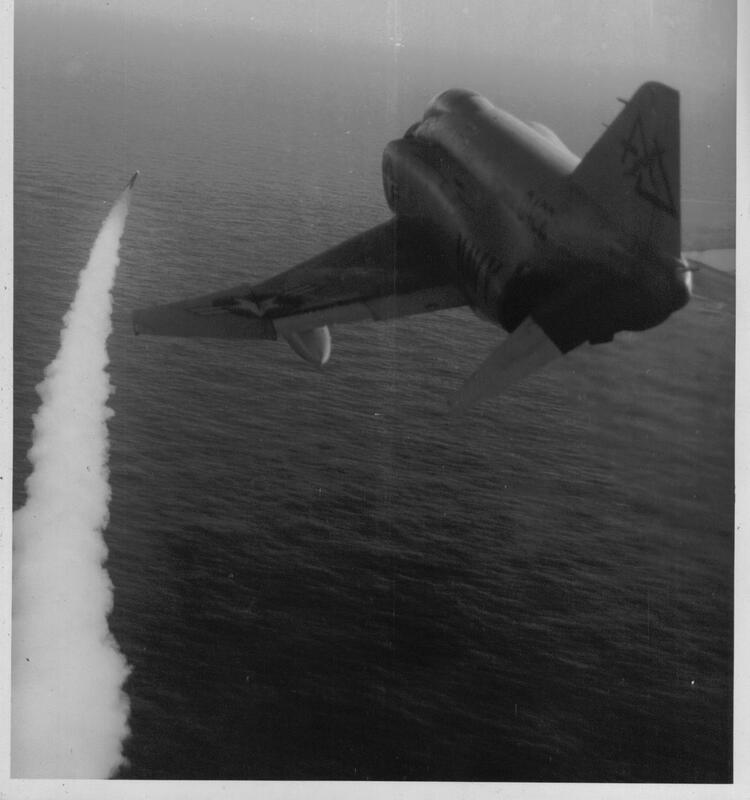 The launch attempt was from one of the waist cats, no.4 I think I remember, and was initially normal. Part way down the cat one of the flanges broke and the pendant separated from the aircraft. We found some debris on deck; and, when it was sent in, an engineering analysis showed that machining the flanges with those small fairings allowed localized abnormal stress patterns and cracks to set up. The fix was simply to grind off the fairings and dye check the flanges. It was a depressing investigation on which to work because it seemed that the old fickle finger of fate had sealed the result the instant the cat fired. However, at least we found the cause and the fix worked. If the small amount of debris had not remained on deck, it might have been a mystery until perhaps it happened again. "Just Tried to Help Sir." It seems Ltjg George Gaughran, Det 65 1963, was occasionally plagued with difficulties in making his traps the first time and usually hit long, had to go around again and sometimes again for the same reason. Noticing the consistancy of this occurrence the ever helpful and sometimes creative AMH2 James Weaver decided Ltjg Gaughran was in need of a little assistance with the problem of over shooting the last wire. One fine sunny Mediteranean day I came up on deck for a launch and there was a grappling hook attached to a length of rope strung out behind the tail hook of one of our RF8s. No one seemed to be paying attention to it and up walks Ltjg Gaughran to do his preflight. Noticing the extension to the tail hook he inquired as to who was responsible and what purpose the device was to serve? At this point Jim Weaver voiced that it was his new invention and was intended to solve Mr. Gaughran's overshooting problem. An unheard conversation face to face with Jim Weaver resulted in the invention being declined and quickly removed. We never saw that tail hook extension again, and yes, Mr. Gaughran still had an occasional problem with short tailhooks. A relatively new airman was sent out to make a few adjustments in the cockpit of a squadron RF 8 and in the process inadvertently dropped one of his tools, which quickly disappeared under the ejection seat. Not being able to retrieve it he reported back as to what had taken place. Having did the deed, he was told to go and report the problem to the line shack so the aircraft could be grounded and the riggers would have to pull the seat to retrieve the offending object. Of course the airman was given a talking to about being careful and how much extra work he had caused for other individuals, not to mention the loss of the aircraft to flying status while the seat was being removed and reinstalled. Not wanting to cause a lot of unnecessary work he suggested his own clever solution to correct the situation. Why couldn't the pilot simply fly the aircraft inverted and jiggle it until the tool dislodged and the pilot could catch it in his hand before it hit the canopy. Of course the unsympathetic line chief responded quickly "Pull the @#$% seat!" Lights! Camera! Action! Patent Pending. Lcdr Larry, the O in C of Det 59, was asked if the RF 8 was capable of shooting movies in a forward direction in order to follow a air to ground missile fired from from an aircraft. Lcdr Larry, never having had any experience with such a mission, inquired if it could be done. I had never heard of any movie camera installations for bay one but looked into the possibility of doing so. Having come up with nothing I advised Lcdr Larry there was no such installation available. Of course his question to me was could it be done? I got together with Ens. McCarthy the Photo Officer of Forrestal who indicated he had an electrically operated 16mm move camera which I could use as long as I didn't damage it and returned it to him as received. Vouching for Mr. Larry's flying ability and his desire not to damage the camera we borrowed, I took a spare Bay 1 mount down to the ship's machine shop and a bracket to fit the movie camera was fabricated. The camera was installed and I was able to hook it up electrically to the camera bay power on off switch. The normal film counter wouldn't work as there was no pulse, as from a still camera but Lcdr Larry and I worked out a system that he could use his stop watch to time how much film he had left. The day of the test shot came and since we had tested the camera with the viewfinder we were confident it would work. Sure enough it worked. The missile firing was recorded on film and it was a success. Of course I made points with Lcdr. Larry in getting a job done which to our knowledge was never done before. Well, news of the requirement for forward shooting movies had gotten back to the Squadron and they jumped into action to come up with an elaborate solution to the task. When we got back in I saw no less than two prototypes, which had bells and whistles I never dreamed of. The squadron was never again asked to provide forward looking movie capability but they were ready. Det 59s the only one that ever actually shot movies from bay one in an actual mission.